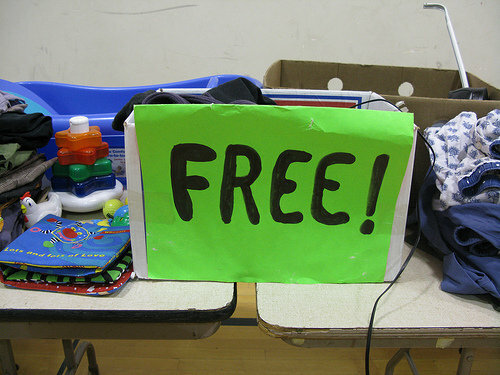 At a Really Really Free Market EVERYTHING is free! Bring what you can, take what you need and at the end of the day the left-overs will be donated appropriately. The more we can provide for one another locally, the closer we are to sustainability! You can post haves/wants before an event to our Facebook Group and/or to the Share Tompkins email list. Food and Produce: veggies, teas, baked goods, jams, tofu, etc. Body Care: tinctures, soaps, etc. Handmade Crafts: ceramics, candles, art, etc. Stuff: electronics, housewares, tools, books, etc. Services: massage, bike repair, web design, accounting, shoveling, moving, etc. Space: housing, working, gardening, etc. + you can offer to host our next event! Our goal is sustainability – please bring stuff that is locally-grown or made from local materials if possible, but everything is welcome! Be prepared to take back home with you left-over items that are over-sized. Please bring stuff that is in good condition or can be easily-repaired – no junk! Join our Facebook group or our email list to stay in the loop about future events. See photos and videos from past RRFMs.